Many options exist to control the contents and behavior of a backup: whether it’s full, differential, or a log, if it should be compressed, copy_only, encrypted, the list goes on and on. Most people will learn these options, understand their effects, and consider themselves to have mastered SQL Server backups. While they’re not totally wrong, there’s still a lot more to the story: where the backups are going. While it’s incredibly simple to use the TO DISK option and write the backup out to one or more files, there are a lot of possible controls over how and where a backup is written out to tape or disk. This post, along with a few others, will discuss those features. Media sets cannot contain more than one type of device, so creating a media set that utilizes both a file and a tape is not possible. Backing up a database will create the necessary media set (if it doesn’t already exist) and then write the backup to the media set. Technically the backup being written to the media set is known as a backup set. First, let’s clear out the backup history so the results of these examples are more apparent. The sp_delete_backuphistory procedure takes a date parameter and will delete all records older than that date. Passing in the current date means everything will be cleared out. As with all my code examples, this should only be executed on a test machine, and never in production environments! Now, let’s create a user database and back it up to a single file. Looking at the results, there’s not a whole lot to a media set. It’s mostly identifiers and a few properties. There’s nothing in there at all about the backup itself; the media set is merely a container that holds backups. Information about the backup is stored as part of the backup set, which has its own table in msdb. The following query displays information about the backup set. Fill in the media_set_id value from the media set query above before running it. A media set is effectively a container, and containers that can only hold one of something are pretty boring. To make sure media sets aren’t boring, Microsoft gave them the ability to contain multiple backup sets. Now let’s take another backup of the same database, and write it out to the same file as before. But what happened to the first backup we took? Nothing at all, actually – it’s still there. The media set (backup file) now has a second backup set containing the second backup. This can be observed by either querying the backupset table or the backup header. Two entries will now be shown. It’s also completely possible for backup sets of different databases to be contained in the same media set. To prove this, let’s add a backup of the master database to our existing media set. The backup set query from above will now show the media set contains three backups: 2 of DemoDB and 1 of master. If you don’t specify which FILE to restore, it defaults to FILE = 1, the first backup set in the media set. The MOVE options tell SQL Server to restore the database files to a new location, rather than attempting to overwrite the existing DemoDB files (and failing). 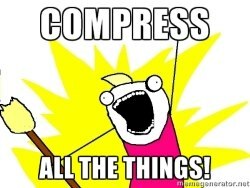 And then there’s compression. If you look above to the query against msdb.dbo.backupmediaset, you’ll see that the result set contains a column called is_compressed. SQL Server native backup compression occurs at the media set level. 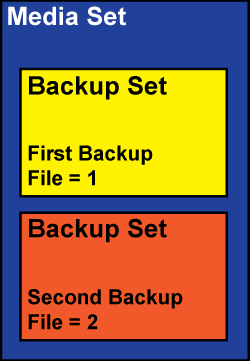 All backups in a media set must have the same level of compression, so the entire media set will contain backup sets that are all compressed, or all uncompressed. Try adding a compressed backup of DemoDB to our existing (uncompressed) media set and you’ll be greeted with the following error. As this error leads us to believe, there are many backup options that can control the behavior of backup sets and media sets. My next post in this series will discuss and explain them. Great post, Bob! Super informative for someone like me who doesn’t know anything about backups and relies on an uber-expert like yourself to make things magically stable, secure, and painless. I hope it’s helpful – thanks so much for reading it and also for providing the last-minute meme graphic when the firewall blocked it! It is really helpful. You clearly explained what is media set and what is backup set. Thank you very much, Shakti! I’m glad you found it helpful! !